What a hassle to plan out ANYTHING using this card. Too much time to try to determine What bus to take, what tram to take, what metro to take etc etc. OVERWHELMING. In fact, we didn’t even use the card except to purchase a hop on hop off bus tour for a discount. We would have been better served to just paid in full for a two day hop on hop off bus tour and not even purchased the Barcelona Card. COMPLETE WASTE OF MONEY for us. Would not recommend. Anything worth seeing isn’t included for free anyway. DON’T WASTE YOUR $ on this. We bought the Barcelona pass for a family of 4 but as we started to use it, we realized that the majority of the "major sites" are not covered on the pass and unless you have a lot of time in Barcelona and want to see the smaller museums, it is not much of a discount especially since we paid a lot for it in the first place. We used the metro to get to places, but we also found that we could walk to a lot of the place from our hotel and that sometimes we walked just the same amount under the tunnels as if we would of walked outside to the places. 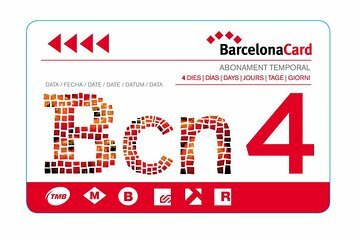 Basically LOOK CAREFULLY AT WHAT YOU WANT TO DO AND IF THE BCN PASS CAN REALLY HELP YOU WITH THE PLACES YOU WANT TO GOBEFORE YOU PURCHASE. Otherwise it is probably cheaper to just get a metro pass as the discounts to restaurants and museums are not the major sites you want to see in the 4 days. As well, we tried one of the restaurants in the pass book and the food was flavourless (near the Picasso museum). Not worth it. Loved using this card for many reasons! We were in Barcelona for 5 days and used the Metro several times a day as our transportation. A great thing to have. One of our favorite cities in the world. The card is a great opportunity to see more and more sites! We saw a very good representation of all the sights. We only wish we could have stayed longer. Excellent to be able to use the public transport to and from the airport. I did not use the card as much as I thought because the bus tour also gives you a discount book for some the same but there were others I decided to see instead. But you need to plan ahead as some of the places have set bookings per time slot. Over all excellent choice. Transportation pass was great, other freebies and discounts didn't get to use much.